Manatees have earned the endearing nickname "Sea Cows" for the laid back way they like to graze, nudging their portly frames through water to leisurely feast on submerged vegetation. But every so often, when they see an especially tasty snack up on shoreline, they'll actually venture on land just to give it a nibble. 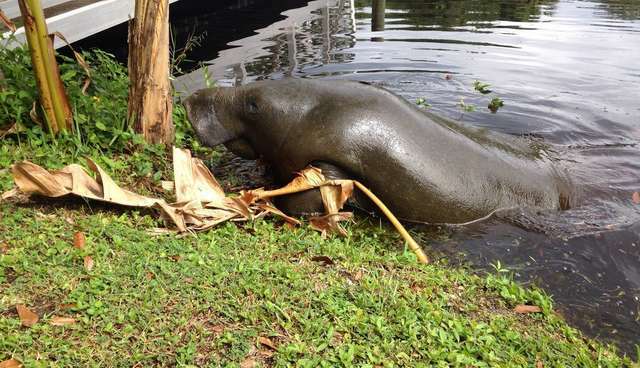 Edgar Stout, who runs a kayaking business in Stuart, Fla., recently spotted one such manatee in the canal out back who was willing to put in a bit of extra effort to reach the sweet, delectable leaves of a banana tree. "He was just eating the grass, munching around. He was moving along the shoreline and happened to get to a spot where there's a banana tree. He was having a hard time getting the end of a banana leaf in his mouth, so all of a sudden he jumped up on his pec fins and pulled himself out of the water to get a hold of it," Stout tells The Dodo. "I've never seen that before. I thought it was cool." After Stout shared a photo of the manatee online, it quickly caught the attention of the Florida Wildlife Commission who got to the bottom of the animal's oddly amphibious act. Biologist Tom Reinert, of the Fish and Wildlife Research Institute, calls the behavior "pec walking," and says it happens more often than most people might think. "It's not unusual for manatees to pull themselves up on the shoreline to find something to munch on," Reinert says. "If it's green, they'll eat it, whether it's grass on the shoreline or mangrove leaves hanging over the water. Manatees eat about 10 percent of their body weight a day, so for a typical 1,000 pound manatee, that's a lot of vegetation and they'll take it where they can get it."